Don’t Let Your Kids Grow Up to be Entitled – Parenting Tips. Age and stage fact: Kids until a certain age think what is is what should be, so giving kids too much too soon breeds entitlement. Not healthy for anyone. Parents want their children to be happy. Normal, but not healthy. Research shows acceptance and gratitude work better. Moreover, children do better when allowed to learn on their own and that often means letting them struggle and sometimes fail. Life at its most basic means water, food, shelter, warmth, and adequate health care. Liberty meant not being a slave and having choices so you can pursue happiness which was not guaranteed. Tip two: Do a happiness inventory. What makes you happy and for how long? Most studies show that two things contribute to happiness once basic rights have been met: a sense of being good and sense of being competent. Moreover, there is a greater sense of competency when one works hard and stuggles to achieve something. Tip three: Know and emphasize the rules that matter. Those rules: safety for all; respect for all living beings, respect for property, and respect for reasonable laws. Start your teaching good manners as soon as your child starts talking. The first ones to teach:”Please “and “Thank You,” helping others, cleaning up after yourself. Part of rule setting is helping your child gain a sense of mission and the healthiest mission is following the “Golden Rule” as preached across the ages. Tip four: Set and use SMART goals then teach your children to do the same as enter their pre-teens and teens. 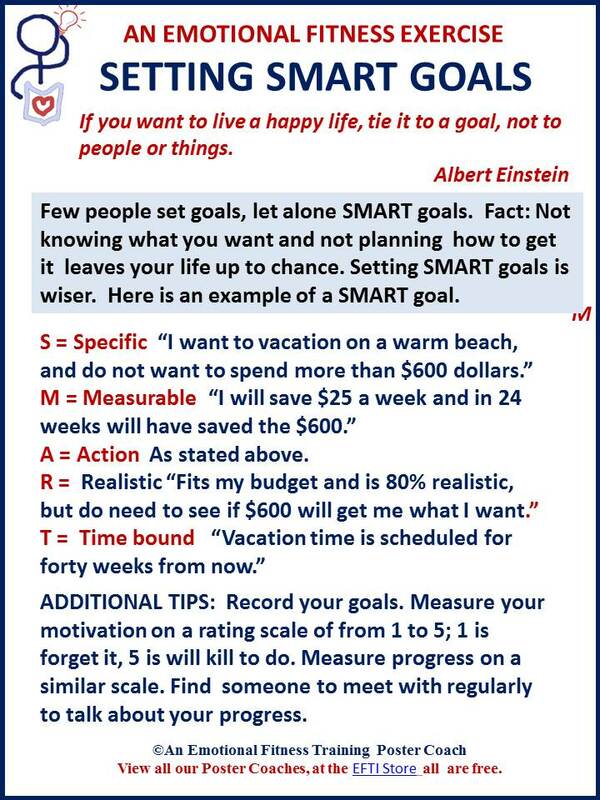 My eBook “Know your Mission So You Can Reach Your Goals detao;s jpw tp set SMART Goals, but here is a quick peek at the smart goal process. My eBook Know Your Mission So You Can Reach Your Goals give you more details. Buy it now, it costs less than a latte. Exhale.Tell us about a time when everything seemed to be going wrong — and then, suddenly, you knew it would be alright. Many times, many ways. But it all turend out okay given time enough.